Since this seems like the most appropriate place to post this, here you go! Since i literally just finished making this, There are still a few bugs, as can be read in the readme i've put into the .rar file. Any help solving these would be appreciated. I fixed diesound not being added to the cfg file, and fixed a small bug where the skirmisher ability wasn't being added. Last edited by Hellfire on May 7th, 2014, 6:44 pm, edited 2 times in total. Re: Wesnoth Unit Creator! Updated! Come on guys, what can i do to improve it? I know some of you have downloaded it, since i have 37 downloads. I've had the same idea for a unit creator, but fortunately never pulled it off. You did a good job so far. Did you use perl? - what is the checkboxed used? for? Last but not least. Simply changing units is realitvely easy and even so your tool might save time, it still lacks one of the most important things. Changing images and animations takes most the time, when creating a new unit. Adding idle, defense, attack and movement to your generator would defininetly help. Thanks for the replies both of you, I'll add as many of those changes as i can soon. Heindal, i made this in visual studio, using visual basic. The "Used?" checkbox is there to indicate whether that attack is created or not. If you were to check it but leave all the boxes blank, it would just leave you with a blank attack pattern. I'm bit of a noob when it comes to both playing and modding BfW, so you'll have to forgive me. If you could help me out by giving me examples of what you want me to do, that would be great. Edit: Check the OP for another update to it. All additions to it are listed. What is the name of the code used for a all range attack? I can't seem to find it. 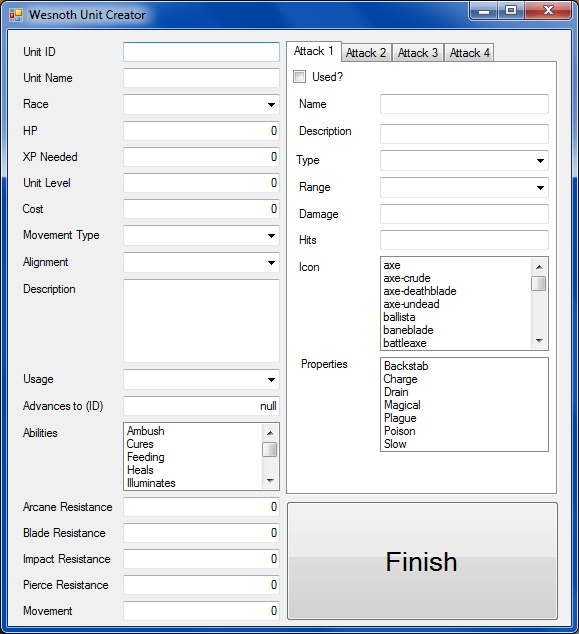 Dropdown for existing attacks: would be a lot of work, and premade attacks can be easily replicated with the program already. If i do add this, it will be when there isn't much left to add. For the abilities added, I've added all those that have macros that were mentioned on the wiki, i'm not aware of any others. If you could link me to a page with them i would be grateful, since it's a easy change to add. I've added a textbox for image paths, i will add them for abilities and specials soon. What do you mean by a save pattern button? Loading existing units is difficult for me, since the only way i can think to do it would be to store the entire file in a string, loop to find the wml tags, then read what comes after the tags, until a space is found. It would take a while. What do you mean by "support for not to overriding movetype's resistances"? Huh, there's a file i haven't seen before! I'll be sure to add everything i find in there to the creator. My bad . Strike what I said about range. You can define own ranges, for example to create an attack that can't be countered. These ranges however have to be defined first, otherwise this attack will look odd. You could change the range setting like you did it with the race, to let the creator define an own range if required. Units also have a portrait and a basic unit picture which is missing in your definition. Types of animations can be found under: "Events triggering animations and default animations"
You should concentrate on the following animations: standing, movement, idle, death, defend, attack which imho are the most important kinds of animation. I will provide an example unit definition with these six animations later, but maybe something like this already exists. Here you go, I've made an example for the most common kinds of animations. description=_ "Angels sometimes appear changing the fates of the world. Some people believe that they are messenger send by a higher being - the one god - and that they appear to those who are peaceful and even fight by the side of those who are worthy. Even if that should be true, an angel is a fearsome, powerful being and should be approached with respect and carefulness. An angel is always surrounded by loyal minions. Separated from his minions a demon assassin might have chance to beat even this powerful entity. Angels however feel its their duty to protect the innocent, so their defence on a village is remarkable and an angel in such a defensive position is almost undefeatable." This contains all pictures used in the example. I just made them for my campaign Strange Legacy. Thanks for the example! I'll do my best to add animations, but no promises. Hey I had a quick question, I don't know if anyone will see this, but I'm trying to get a Special Weapon I made work, but I cant seem to get it to work. maybe I'm missing a step in making it. I put it into the abilities and in the special notes, is there anything else I need to do to get it to work? aqwed16 wrote: Hey I had a quick question, I don't know if anyone will see this, but I'm trying to get a Special Weapon I made work, but I cant seem to get it to work. maybe I'm missing a step in making it. I put it into the abilities and in the special notes, is there anything else I need to do to get it to work? the special notes are only meant for notes about the ability to appear in unit descriptions. to make them actually work, but them in [abilities]/[specials] tags respectively (the latter should be put inside [attack] tag, btw). btw, idea: instead of just selecting the movetype, add an option to choose defenses/movement costs for the unit, with a "as in movetype" default option.